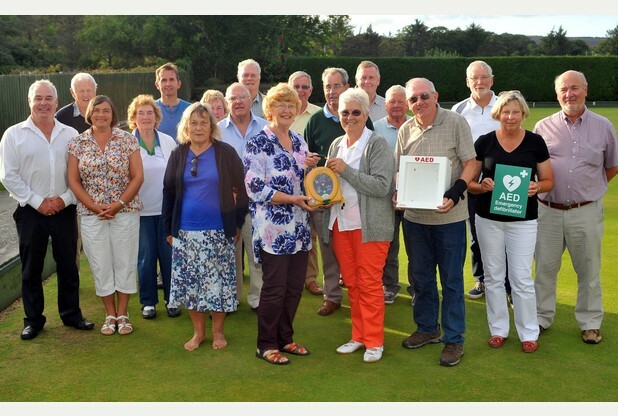 Porthleven Bowling Club in Cornwall is now equipped with a lifesaving HeartSine samaritan® PAD Automated External Defibrillator (AED), just months after the club’s groundsman suffered a near fatal Sudden Cardiac Arrest (SCA) on the club’s premises. Groundsman Mike Rutter’s SCA unexpectedly took place on the Bowling Club’s green field. Fortunately, due to the quick thinking of two members that immediately began performing cardiopulmonary resuscitation (CPR) on Rutter, he was kept alive until the emergency services arrived and took over. As soon as Rutter collapsed, a man ran to fetch an AED located at a nearby local business, but by the time he returned, the emergency services had already arrived. It is a common misconception to believe that CPR alone and calling the emergency services is enough during a SCA. CPR is a temporary measure that maintains blood flow and oxygen to the brain. It will not return a heart to a normal rhythm during ventricular fibrillation (VF). The key to survival is defibrillation – and the sooner the better. Only defibrillation can restart a heart to a normal rhythm. The HeartSine defibrillator was funded by club members and local businesses, including Mitchell’s Builders of Porthleven, Helston and District Lions Club, Porthleven Town Council and Cornwall councillor Andrew Wallis through the County Community Fund. Read the full news feature here.